How are the children doing? 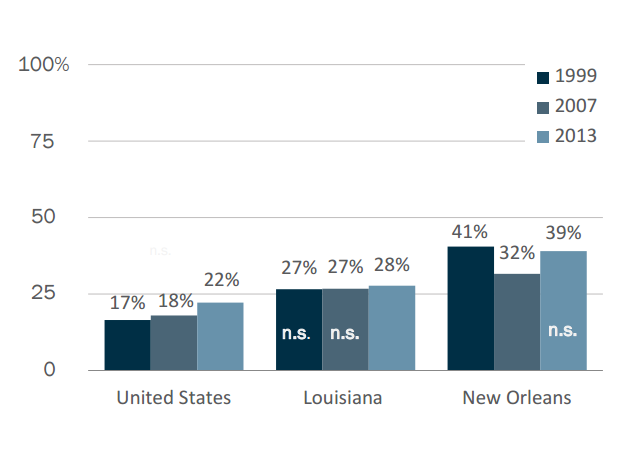 In 2015, The Data Center produced its inaugural New Orleans Youth Index. This report provided a statistical snapshot of the well-being of New Orleans children and youth age 0-24. The New Orleans Youth Index 2016 includes additional basic demographic information on how many children are living in New Orleans, whether that number is growing or shrinking, as well as information about demographic shifts in the city’s child and youth population. The Index presents evidence to suggest that master planning, systems reform, and organizational focus are needed to improve current conditions that limit youth’s potential. A concerted effort is needed to help our youth reach their highest potential. The depth and breadth of all Data Center reports are dependent upon access to reliable data. In Louisiana, we have been fortunate that the Louisiana Department of Education (LDOE) has a long history of making available high quality data on enrollment, demographic characteristics of students, and school performance scores, among other metrics. Years before Katrina, The Data Center (then known as the Greater New Orleans Community Data Center) was able to publish enrollment and demographic data on public school students from the Department of Education’s annual District Composite Reports, which were freely available on their web site in PDF format. After Katrina, the Department of Education began making this same data freely available in downloadable spreadsheets. The Data Center had to spend time carefully identifying which Recovery School District schools were in Orleans versus other parishes, in order to tabulate the total number of New Orleans students in public schools each year—an important indicator of our post-Katrina population recovery. The Data Center, subsequently, recommended that the LDOE add parish location for each school to its downloadable spreadsheet, which they did—demonstrating the high priority they placed on making available usable data for the public. However, after the 2010-2011 school year, retrieving data from the Louisiana Department of Education became increasingly difficult. By the 2012-13 school year, the LDOE removed data that was once on its website years prior, eliminated parish location, and modified or suppressed data on race/ethnicity, free/reduced lunch, grade placement, and limited English proficiency. To better understand who is choosing to attend public schools in New Orleans, it would be useful for the public to examine changes in economically disadvantaged populations in public schools and grade levels by school type over time. But, many important questions can no longer be easily answered because the LDOE no longer posts data for years before 2012-2013; has changed the labels of certain categories (e.g. “free and reduced lunch”); and has suppressed much of the data. To be clear, there are currently two accessibility problems: Restricted release of school-level information as well as a narrower release of student-level, anonymized data that protects students and families. Curating both kinds of data significantly reduces transparency as well as the ability of the public, including research organizations, to hold the LDOE accountable. In October 2016, in a lawsuit settlement with education activists, the Louisiana Department of Education announced it would no longer suppress any student enrollment data relating to economically disadvantaged and English proficiency students. But, access to data prior to October 2012 is still not readily available. The LDOE has established partnerships and memorandums of understanding with high quality research organizations, such as the Center for Research on Education Outcomes (CREDO) at Stanford University and the Educational Research Alliance (ERA) at Tulane University. But, by limiting the data to specific research organizations, LDOE subtly puts CREDO and ERA in position to respond to community pleas for data that, in many cases, these researchers are forbidden from releasing. Democratizing information as well as facilitating and promoting the direct and practical use of data by youth, parents, and community organizations are essential to the continual improvement of schools and youth well-being. At the end of the day, parents, students, and community members can’t make good decisions if they don’t have access to information. The LDOE’s primary partner in data-based decisionmaking should be the public. Assessing how New Orleans’ children are doing requires foundational contextual information about how many children are living in the city, whether that number is growing or shrinking, as well as information about any demographic shifts in the city’s child population. HOW ARE NEW ORLEANS’ CHILDREN AND YOUNG PEOPLE DOING? New Orleans’ population of youth ages less than 20 years old grew 5 percent from 84,517 in 2010 to 88,850 in 2015. This growth was dominated by increases among the white and Hispanic youth populations and declines among the African American youth population. In 2010, 18 percent of youth age 0-19 in New Orleans were white, while 73 percent were black. By 2015, 21 percent of youth age 0-19 in New Orleans were white, while 68 percent were black. The share that is Asian has remained consistent at 3 percent, while the share that is Hispanic has grown only slightly to 6 percent. As of 2015, New Orleans was home to 60,072 African American youth, 18,948 white youth, 5,346 Hispanic youth, and 2,262 Asian youth. Many have speculated that gentrification is pushing African American families with children out of New Orleans, in particular, to Jefferson Parish. And, while gentrification and its affects are outside the scope of this report, the demographics of the youth population by parish actually points to shrinking numbers of black youth in Jefferson Parish from 2010 to 2015. Among the eight parishes in the metro, only St. Bernard and St. Tammany parishes experienced growth in their African American youth populations from 2010 to 2015. Data on child population comes from the Census Bureau’s Population Estimate Program (PEP). The PEP calculates population change based on the most recent decennial census to produce an estimate of population and demographics. The county estimates for race and age only are displayed in 5-year age groups. For this reason, the data displayed is for the population under 20 years of age. Scientific research has shown that child poverty can lead to chronic, toxic stress that disrupts the architecture of the developing brain. Children in poverty are much more likely to experience exposure to violence, chronic neglect, and the accumulated burdens of economic hardship. This kind of chronic stress causes prolonged activation of the stress response system which, in turn, can disrupt the development of brain architecture, leading to lifelong difficulties in learning, memory, and self-regulation. In short, scholars argue that poverty may be the single greatest threat to children’s healthy brain development. HOW ARE NEW ORLEANS’ CHILDREN DOING? In 2015, 36.9 percent of New Orleans’ children under 18 were in poverty, which is a drop from 2014 when it was 43.8. The 2015 percentage is still much higher than the percentages for the state of Louisiana at 28.4 or the U.S. at 20.7. It will be important to see a sustained downward trend in the poverty rate in New Orleans to be sure poverty is on the decline and assess the reasons why. By definition, poverty for children is a function of their family’s household income. In other words, the wages of adult family members determine whether children live in poverty. Poverty status is determined by comparing a family’s annual income to a set of poverty thresholds (in dollars) that vary by family size, number of children, and age of householder. If a family’s pre-tax income is less than their given poverty threshold, then that family and every individual in it are counted as living in poverty. The financial stability of children in families is dependent on the parents’ income, usually their income through work. Secure parental employment is associated with reduced risk for poverty, higher family income, and access to private insurance. And, higher family income is associated with positive child outcomes, such as better health, behavior, academic achievement, and financial well-being as adults. In 2015, the percent of children under 18 with at least one working parent in New Orleans was 83 percent. The percent of children with at least one working parent in Louisiana was 88.4 percent. Both rates for New Orleans and the state of Louisiana were significantly lower than the rate for the United States, which was 91 percent. Furthermore, the share of children with at least one parent working did not increase in either New Orleans or Louisiana from 2014 to 2015. Data on employment status was derived from Questions 29 and 35 to 37 in the 2015 American Community Survey (ACS). Employed includes part-time employment. Most young people will be working their first jobs between the ages of 16 and 24 years old. Youths’ first jobs could be critical to establishing social and economic stability for the rest of their lives. Youth employment can teach them responsibility, assist in the development of organizational and time management skills, help cultivate good work habits, offer valuable work experiences, and encourage financial independence. HOW ARE NEW ORLEANS’ YOUNG PEOPLE DOING? In 2015, 18.8 percent of New Orleans young people age 16-24 were unemployed compared to 15.2 percent in Louisiana and 13.3 percent in the United States. In 2015, New Orleans did not have a significantly higher youth unemployment rate than the state, but it was significantly higher than the U.S. The data on employment status was derived from Questions 29 and 35 to 37 in the American Community Survey (ACS). All civilians 16 years old and over are classified as unemployed if they (1) were neither “at work” nor “with a job but not at work” during the reference week, (2) were actively looking for work during the last 4 weeks, and (3) were available to start a job. Also included as unemployed are civilians who did not work at all during the reference week, were waiting to be called back to a job from which they had been laid off, and were available for work except for temporary illness. Young people age 16-24 who are out of school and out of work are often referred to as “disconnected youth,” and in recent parlance as “opportunity youth,” because of the potential value they could add to their communities. Some of the pathways to disconnection include the following: leaving high school without a diploma, finishing high school or college but still lacking the essential education or skills to obtain a decent job, having a criminal record that prevents or reduces the chances of employment, and having parenting/family responsibilities that impede employment or school attendance. In low-income communities, the incidence of disconnection is much more pronounced. In 2014, 14.5 percent of New Orleans youth were considered opportunity youth compared to 19.8 percent across the state of Louisiana and 13.8 percent across the United States. The Cowen Institute released its 2016 comprehensive examination of opportunity youth at the national, state, and parish levels. Margins of error were not provided. All data in that report came from the U.S. Census Bureau, American Community Survey, 2014. Housing is a large monthly expense for nearly every American family, and the ability to afford stable housing can significantly impact a family’s well-being. A common measure of affordability is the percent of households paying more than 30 percent of their pre-tax household income on all housing costs. Such households are considered “housing cost-burdened.” Households that pay more than half of their income on housing are considered “severely cost-burdened.” Severe housing cost burdens of more than 50 percent of household income indicate a serious problem in housing affordability. In 2015, more than half (54 percent) of all New Orleans households are renters. Of these, one-third (36 percent) are severely cost burdened; that is, they pay more than half their pre-tax household income on rent. Housing costs are particularly burdensome for lower income households. In 2015, fully 88.4 percent of all New Orleans renters that earn less than $35,000 per year pay more than 30 percent of their income on housing costs, while 60.1 percent of this group pay more than half of their income on housing. In New Orleans, homeowners account for only 46 percent of all households. Among homeowners, just 15 percent are severely cost-burdened (paying more than half their income for housing). But again, homeownership is more burdensome for lower income households. Of those homeowners who earn less than $35,000 annually, 63.8 percent are cost-burdened and 42.1 percent are severely cost-burdened. Fully 63 percent of those earning income in New Orleans earn less than $35,000 through either full-time work, part-time work, or other means such as dividends, rental incomes, Social Security, etc. Indeed, 39 percent of New Orleanians earning income earn less than $17,500 with women more likely than men to earn such low incomes. According to 2015 Census data, fully 59,000 women earning income in New Orleans earned less than $17,500 through either full-time work or other means. The data for homeowners is only tabulated for owner-occupied units. All occupied housing units that are not owner occupied are classified as renter occupied. Housing costs stem from two measures: “Selected Monthly Owner Costs” for owner-occupied units and “Gross Rent” for renter-occupied units. Income for individuals is the summation of eight types of income: wages or salary; self-employment; interest and dividends or net rental income; Social Security; Supplemental Security Income; public assistance; retirement or disability; and all other incomes. The work status of an individual is defined as either full-time or “other”. “Other” includes anyone earning any of the eight income types, but who is not working full-time. Homelessness has a number of negative effects on children and youth including hunger, poor physical and mental health, and missed educational opportunities. Children without stable housing are more likely to repeat a school grade, be expelled or suspended, or drop out of school compared to other children with stable homes. The count of homeless children under 18 in the New Orleans area in 2015 was 137 compared to 220 the year before. In 2015, most of these children – 124 – were living with at least one adult, while 13 children were living with no adult present. Continuum of Care (CoC) Homeless Assistance Programs Homeless Populations and Subpopulations Reports provide counts for sheltered and unsheltered homeless persons by household type and subpopulation available at the national and state level and for each CoC. The reports are based on Point-in-Time (PIT) information provided to U.S. Department of Housing and Urban Development (HUD) by CoCs in the application for CoC Homeless Assistance Programs. The PIT Count provides a count of sheltered and unsheltered homeless persons on a single night during the last ten days in January. UNITY does an annual Point-In-Time Count of the homeless every year on January 30th. The data is reported to HUD every year by April 30th and is publicly available on the HUD website. Data is combined data for Orleans and Jefferson parishes. Infant mortality is commonly used as an indicator of population health and well-being. Growing evidence suggests that infant mortality within a population is linked to that population’s overall health and development across the lifespan. Factors affecting the health of entire populations such as maternal health, access to medical care, socioeconomic status, and public health practices can also impact infant mortality rates. In 2014, the New Orleans infant mortality rate was 5.2 per 1,000 live births compared to 7.7 for Louisiana. For this indicator, New Orleans fares better than the state. Infant mortality refers to the death of a child within the first year of life and does not include stillbirths. This data was obtained from the “Louisiana Health Report Card 2015”. The Louisiana Department of Health produces a report card every year in accordance with Louisiana state law. The report is compiled by the Office of Public Health with data from the Bureau of Health Informatics. The report provides data by parish as well as for the state as a whole. In 2014, New Orleans had a higher share of infants born with low birthweights than the state of Louisiana and the U.S. In New Orleans, 11.8 percent of infants were born with low birthweights compared to 10.5 percent for the state and 8.0 percent for the U.S.
National data was obtained from the “National Vital Statistics Reports” published by the National Center for Health Statistics (NCHS). New Orleans and Louisiana data was pulled from the “Louisiana Health Report Card 2015”. The Louisiana Department of Health produces a report card every year in accordance with Louisiana state law. The report is compiled by the Office of Public Health with data from the Bureau of Health Informatics. The report provides data by parish as well as for the state as a whole. One of the best ways to protect children from harmful diseases is to make sure they have all of their vaccinations so that they are immunized against diseases. There are 16 potentially harmful vaccine-preventable diseases that could lead to hospitalization or even death of infants, children, or teens. Immunization reduces the vulnerability of all children to disease and improves the health of all children. According to the most current data available, 76.4 percent of children in New Orleans were immunized compared to 80.1 percent in Louisiana. The state’s target is 90 percent. Both New Orleans and the state were below the target percentage during the first quarter of 2014. How is this data reflected in our community? Read these insights from New Orleans residents. This data was obtained from the Louisiana Kids’ Dashboard. The data is reported on a quarterly basis. The immunization rate is a measure of the percent of children vaccinated with Diphtheria-Tetanus Toxoids-acellular Pertussis vaccine (DTaP) (4 or more doses) and Measles-Mumps-Rubella vaccine (MMR) (1 or more doses). These vaccines prevent younger children from getting sick with serious but preventable diseases such as measles, mumps, rubella, diphtheria, pertussis, tetanus and more. The Department of Health and Hospitals has an immunizations program that works with health officials around the state to update and monitor the Louisiana Immunization Network for Kids, which stores patient vaccination records in a central location. Obesity in childhood has both immediate and long-term effects on health and well-being. Obese children are more likely to have risk factors for cardiovascular disease, such as high cholesterol or high blood pressure, prediabetes, bone and joint problems, sleep apnea, and social and psychological problems, such as stigmatization and poor self-esteem. They are also more likely to be obese as adults and, subsequently, more at risk for adult health problems, including heart disease, type 2 diabetes, stroke, several types of cancer, and osteoarthritis. In 2007, an estimated 16.7 percent of New Orleans children were obese and 17.4 percent were overweight. In Louisiana, 15.4 percent of the children were obese and 17.5 percent were overweight. The data reported here was collected through the Youth Risk Behavior Surveillance System (YRBSS), which monitors priority health-risk behaviors and the prevalence of obesity and asthma among youth and young adults. YRBSS includes a national school-based survey conducted by The Center for Disease Control and Prevention (CDC) and state and local school-based surveys conducted by state and local education and health agencies. In 2007, as a component of YRBSS, communities participating in the Steps Cooperative Agreement Program (Steps Program) also conducted school-based surveys of students in grades 9–12 in their program intervention areas. These communities used a standard questionnaire that measured tobacco use, dietary behaviors, and physical activity and monitored the prevalence of obesity and asthma. Unfortunately, there has not been any local data collected for New Orleans since 2007. There is no indicator that is based on publicly available data that more accurately provides a picture of how well kids in New Orleans are faring in this area. Regular physical activity increases physical health and psychological well-being. It helps build and maintain healthy bones and muscles, helps reduce the risk of developing obesity and chronic diseases, such as diabetes, cardiovascular disease, and colon cancer. Research has shown that it also reduces feelings of depression and anxiety and promotes psychological well-being. On the flip side, physical inactivity and poor diet can increase children’s risk for diabetes, high blood pressure, high cholesterol, asthma, and arthritis. According to the most current data available, 23.6 percent of New Orleans high school students did not participate in at least 60 minutes of physical activity on at least 1 day in the last 7 days compared to 17.1 percent in Louisiana. The data reported here was collected through the Youth Risk Behavior Surveillance System (YRBSS), which monitors priority health-risk behaviors and the prevalence of obesity and asthma among youth and young adults. YRBSS includes a national school-based survey conducted by CDC and state and local school-based surveys conducted by state and local education and health agencies. In 2007, as a component of YRBSS, communities participating in the Steps Cooperative Agreement Program (Steps Program) also conducted school-based surveys of students in grades 9–12 in their program intervention areas. These communities used a standard questionnaire that measured tobacco use, dietary behaviors, and physical activity and monitored the prevalence of obesity and asthma. Unfortunately, there has not been any local data collected for New Orleans since 2007. A number of negative outcomes are associated with teen childbearing. Teen parents are less likely to finish high school, are more likely to be poor as adults, and are more likely to rely on public assistance. At the same time, children of teen mothers are more likely to have poorer educational, behavioral, and health outcomes. In 2014, 29.3 per 1,000 females between the ages of 15-19 in New Orleans gave birth compared to 35.5 per 1,000 teens across Louisiana. Louisiana had a higher teen birth rate than New Orleans. Teen birth rate data was obtained from the “Louisiana Health Report Card 2015”. The Louisiana Department of Health produces a report card every year in accordance with Louisiana state law. The report is compiled by the Office of Public Health with data from the Bureau of Health Informatics. The report provides data by parish and for the state as a whole. School enrollment data can help school leaders and families in their planning by simply illuminating where students are going to school. The Data Center has a long history of tracking K-12 enrollment data for Orleans Parish, differentiating between public and nonpublic schools, and also assessing demographic changes in enrollment. However, after the 2010-2011 school year, the Louisiana Department of Education began changing certain categories and curtailing the availability of some data—making it much more difficult to determine how enrollment in public and nonpublic schools is changing. From the limited data we were able to acquire from the Louisiana Department of Education, we concluded that nonpublic school enrollment has not increased in recent years – hovering around 19,000 students since the 2010-2011 school year, while public school enrollment has increased by more than 8,500 students from 39,877 in the 2010-2011 academic year to 48,447 in the 2015-2016 academic year. Data from Census Bureau surveys indicate that of all children age 3-17, the share enrolled in private schools, at 24.6 percent in 2015, has not significantly changed since 2010. Nonetheless, the share of children in private schools is much higher in Orleans Parish than the national average where it is only 11.7 percent. Meanwhile, the share enrolled in public schools has increased from 62.2 percent in 2010 to 68.8 percent in 2015 while the share of children not enrolled in school has decreased from 11.2 percent in 2010 to 6.6 percent in 2015. These trends are difficult to interpret but they do suggest that, overall, public schools are retaining more students who would typically not attend private schools, and there has not been an “exodus” from private to public schools in New Orleans. In order to better understand who is choosing private and parochial schools over public schools in New Orleans, it would be useful to examine changes in economically disadvantaged populations in public schools and in grade levels by school type. But, many important questions can no longer be answered because in 2010, the Louisiana Department of Education changed the labels of certain categories (e.g. “free and reduced lunch”), and – even worse – suppressed much of the data. The data on enrollment status was derived from Question 10 in the 2015 American Community Survey (ACS). People were classified as enrolled in school if they were attending a public or private school or college at any time during the 3 months prior to the time of interview. People enrolled in “vocational, technical, or business school” were not reported as enrolled in school. Any respondents who marked both the “public” and “private” boxes were assigned to the first entry, “public.” Respondents were asked to indicate whether they were enrolled by marking one of the questionnaire categories for “public school, public college,” or “private school, private college, home school,” therefore including home schoolers as part of private school enrollment. The achievements of the young adults of tomorrow can be shaped by the academic and nonacademic skills they possess at the time they enter school. School readiness has been shown to predict later school achievement, high school completion, and employment. Children that lag behind their peers at school entry may have challenges that prevent them from reaching their full potential. For this reason, it is imperative to determine which children can benefit from increased prevention and intervention efforts in all communities. The EDI is a 104-item teacher checklist that measures school readiness as an indicator of children’s early development. It was developed at the Offord Centre for Child Studies at McMaster University in Ontario, Canada, and measures children’s readiness to learn at school in five recommended domains. The five domains are physical health and well-being; social competence; emotional maturity; language and cognitive skills; and communication skills and general knowledge. Each student receives a score based on the teacher-completed checklist and the score determines if the child is “vulnerable”, “at-risk”, “on-track,” or “very ready” on each domain. In the 2012-2013 school year, 32 percent of all children in New Orleans were vulnerable on at least one domain, with 18 percent vulnerable on two or more domains of school readiness. Compared to the national norms, New Orleans children are more vulnerable. The national norm rate of vulnerable on at least one domain is 26-32 percent. New Orleans is at the high end at 32 percent. The national norm rate for vulnerable on 2 or more domains is 13-16 percent. New Orleans is above that rate at 18 percent. To help quantify the extent of school readiness in neighborhoods in New Orleans, the Orleans Public Education Network (OPEN) coordinated the collection of comprehensive Early Development Instrument (EDI) data on 65 percent of all kindergarten age children in both public and private schools in Orleans Parish in the 2013 school year. This data provides a comprehensive assessment of our kindergarten children’s school readiness—both by the school they attend, and by the neighborhood in which they live. Across all domains, performance on the EDI predicts their performance later in elementary school. An increase in vulnerabilities across the five domains increases the likelihood that children will struggle to meet basic competencies by third or fourth grade. The EDI data was selected as a measure of kindergarten readiness instead of any statewide assessments because the new statewide assessments of kindergarten readiness have not been fully implemented and baselines have not been developed. Louisiana Legislature passed Act 3 in 2012 requiring the creation of a unified network of early childhood care and education that would establish a common expectation for excellence among all publicly-funded providers. When fully implemented in 2016, the networks will expand access to high quality, publicly-funded early childhood programs to families across Louisiana to ensure more children enter school kindergarten ready. It has been widely reported that until third grade, children learn to read; after third grade, they read to learn. For that reason, reading skills in third grade are considered an important early warning indicator of academic performance. Reading skills in third grade are highly predictive of future academic performance. Third grade children with limited reading abilities will have a harder time keeping up with other students across multiple subjects—including math, science, and other languages. In 2016, the percent of New Orleans third grade students scoring at basic or above on the Partnership for Assessment of Readiness for College and Careers (PARCC) tests of English language skills was 51 percent. The percent of Louisiana third grade students who scored basic or above on the PARCC tests of English language skills was 62 percent. There have been major changes in how Louisiana has assessed early reading over the past 15 years. First, to comply with the 2001 No Child Left Behind Act, Louisiana developed the Integrated Louisiana Educational Assessment Program (iLEAP). The iLEAP English language arts and math tests are administered at grades 3, 5, 6, 7, and 9. The iLEAP reading subscore was the official assessment of early reading. All items were specifically developed for the iLEAP according to the state content standards, benchmarks, and Louisiana Grade-Level Expectations (GLEs). Then after 2011, the iLEAP reading subscore was discontinued as the official assessment of early reading in Louisiana. Louisiana law mandates that the State Board of Elementary and Secondary Education (BESE) require administration of an early reading assessment by all public elementary schools enrolling students in grades K-3. The assessment that has been approved by BESE for this purpose beginning in the Fall of 2011 is the Dynamic Indicators of Basic Early Literacy Skills 7th Edition, (DIBELS Next). DIBELS Next is used by districts/schools to screen early literacy skills, reflect progress in reading skills, predict a student’s likelihood of future success in reading achievement, and indicate areas in which a student needs intervention. For the 2016 school year, some districts have submitted waiver request applications to use other assessment tools besides DIBELS Next for students in kindergarten–third grade. These districts believe these other tools are better in supporting reading assessment and instruction. In order to get statewide or city wide data, a common reading assessment and consolidated data is needed to determine the reading levels of students in all schools, both public and private. Currently, the Louisiana Department of Education reports this data separately for individual schools in the Recovery School District. Because some schools and districts chose to opt out of using the DIBELS Next, the Partnership for Assessment of Readiness for College and Careers (PARCC) tests of English language skills were used as an assessment of reading skills instead. In the 2015 school year, the PARCC tests replaced the LEAP and iLEAP exams in English and math. Every year, many first year college students learn that they must take remedial courses in English or mathematics, which do not earn college credits. The problems associated with students not being college ready also apply to 2-year colleges. A study of 2-year college English language arts and math courses showed that many students are not adequately prepared for those courses. The research showed that the math taught at 2-year colleges was almost exclusively at a middle school level. Researchers found that instructors in applied math programs frequently devise their own materials, since students are so often not taught in elementary or secondary schools the specific skills needed to succeed in those courses. The researchers also found that English language arts introductory courses have high failure rates. In addition, students are asked to do very little writing; when they do write, the expectations for reasoning, logic, and even grammar are quite low. Improving student performance on math and English language tests is important in order to help more students not only enroll in college, but also to increase the number who successfully complete college. The percent of New Orleans third–eighth grade students scoring mastery and above on 2016 PARCC English language and math tests was 31 percent in Spring 2016 compared to 28 percent in Spring of 2015 and 22 percent in Spring 2014. The percent of Louisiana students who scored mastery or above on the PARCC English language and math tests was 38 percent in Spring 2016 compared to 33 percent in Spring 2015 and 26 percent in Spring 2014. For 2015, students participated in the new Louisiana-based assessments that included less than half of its math and English questions coming from the Partnership for the Assessment of Readiness for College and Careers (PARCC). PARCC tests replaced the LEAP and iLEAP exams in English and math in Louisiana in 2014. There are 5 different achievement levels that students’ test scores represent: Advanced=Exceeded expectations, Mastery=Met expectations, Basic=Approached expectations, Approaching Basic= Partially met expectations, and Unsatisfactory=Did not meet expectations. The percent of students who scored at mastery and above on the PARCC tests represents the percent of students who have the skills they need to be prepared for college. This data does not include achievement test scores of private school students. School attendance is an important factor in school achievement. When students don’t attend school, they miss lessons and risk academic failure due to falling behind other students in coursework completion. Chronic truancy or absenteeism is a strong predictor of academic failure, dropping out of school, substance use, gang involvement, and criminal activity. The truancy rates in New Orleans and the state of Louisiana have fluctuated since 2008. In 2008, 29.5 percent of New Orleans students were considered truant and 19.0 percent in 2015. Statewide, the percent of students considered truant in 2008 was 14.7 percent and 28.1 percent in 2015. Louisiana tracks truancy instead of chronic absenteeism. Chronic absenteeism is usually defined as missing ten percent or more of school days. In Louisiana, truancy is defined as any student having either 5 unexcused tardies or 5 unexcused absences within a school semester. Nationally, out-of-school suspension rates have escalated dramatically since the 1970s. The higher use of out-of-school suspension partly reflects the growth of policies such as zero tolerance, an approach to school discipline that imposes removal from school for a broad array of school code violations—from violent behavior to truancy and dress code violations. Research has shown that suspensions do not improve overall safety and are associated with lower academic performance, higher rates of dropout, failures to graduate on time, increased academic disengagement, and subsequent disciplinary exclusions. New Orleans schools are more likely to suspend students out-of-school compared to all other parishes in Louisiana. The higher rates of out-of-school suspensions have been consistent for several years. In 2013, 87 percent of the suspensions were out-of-school suspensions in New Orleans compared to 39 percent in all other parishes. Similarly in 2012, 86 percent of suspensions were out-of-school suspensions in New Orleans compared to 41 percent in all other parishes. It should be noted that the rates of out-of-school suspensions in New Orleans have been lower than pre-Katrina years. From 2001 to 2005, the rates of out-of-school suspensions ranged from 93 to 99 percent. In contrast, from 2008 to 2013, the rates ranged from 81 to 87 percent. Nevertheless, the rates appear to be increasing since 2009. Data was received by direct request from Nathan Barrett at the Education Research Alliance (ERA). The data could not be updated because the Louisiana Department of Education no longer makes it publicly available and has not supplied updated data to ERA despite their formal data sharing agreement. National data shows that racial disparities persist in school suspension rates. A recent study showed that the problem is worse in southern states, including Louisiana. Black students are suspended at rates five times higher than their representation in the student population. Research has shown that suspensions do not improve overall school safety and are associated with lower academic performance, higher rates of dropout, failures to graduate on time, increased academic disengagement, and subsequent disciplinary exclusions. Therefore, black students suffer the negative outcomes disproportionately more than other students. Data on suspension rates from 2001 to 2013 shows that black students consistently had higher suspension rates than white and other students. The latest data for 2013 shows the lowest suspension rate for black students since 2002, at 14 percent. However, the rate is still three times the rate for white and other students, which are at 4 percent each. Obtaining a high school diploma is an important milestone marking a successful transition into adulthood. High school graduates tend to be healthier, earn higher incomes, vote more, and face fewer obstacles as they enter adulthood. High school graduation rates are also an important indicator of school performance for parents, policymakers, and concerned community members. According to research by the Alliance for Excellent Education, “As a result, graduation rates must be a cornerstone of high school accountability and used in decision-making about the targeting of resources and interventions to low-performing schools.” The Louisiana Department of Education includes high school cohort graduation rates in the calculation of high school performance scores as a means to hold schools accountable for graduating their students on time. The available data suggests that the cohort graduation rates for New Orleans increased from 54 percent in 2004 to 75 percent by 2015. 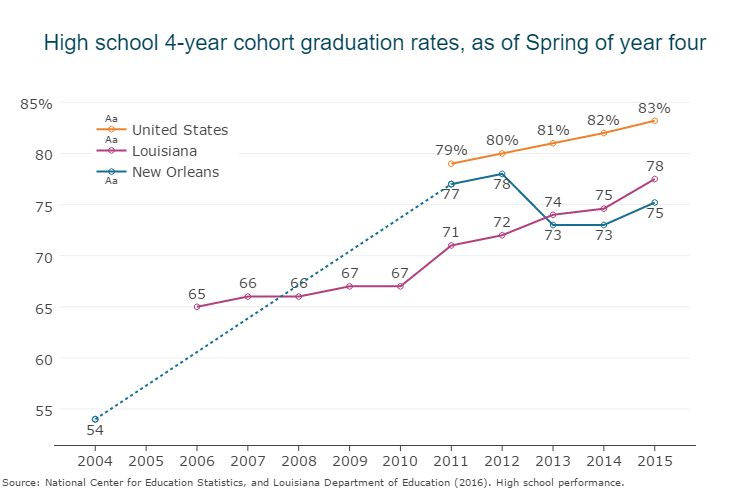 Between 2011 and 2015, high school cohort graduation rates for New Orleans students have fluctuated between 73 and 78 percent. The state of Louisiana’s cohort graduation rates have ranged between 71 and 78 over the same years. The Louisiana Department of Education did not calculate the cohort graduation rate for 2005, and the 2004 cohort graduation rate was calculated after the fact. As such, 2004 graduation rate data was not certified at the district level at the end of that year. The adjusted cohort graduation rate (ACGR) is considered the most accurate measure available for reporting on-time graduation rates. A 4-year ACGR is defined as the number of students who graduate in four years with a regular high school diploma divided by the number of students who form the adjusted cohort for that graduating class. The term adjusted cohort means the students who enter ninth grade plus any students who transfer into the cohort in grades 9–12 minus any students who are removed from the cohort because they transferred out, moved out of the country, or were deceased. It was not until 2011 that all states used this common measure of graduation rates. Chapter 6 of Louisiana’s Department of Education Bulletin 111—The Louisiana School, District, And State Accountability System, defines a cohort as all students who entered ninth grade for the first time in the state of Louisiana in a given academic year. Each cohort of students will be tracked for four years, from entry as first-time ninth graders through four academic years in order to determine cohort graduation rates. Research has shown that education matters for health more than ever before. Adults without a high school diploma have higher morbidity and mortality rates. In addition, they are at greater risk for disability and experience psychological stress at higher rates than their more educated peers, especially those with college degrees. Further, when compared to people who earned a diploma or more, people without a diploma earn less and are more likely to be unemployed. In 2015, the share of young people age 18-24 in New Orleans who had completed less education than a high school diploma was 12.5 percent, statistically unchanged from 2014. New Orleans still had a significantly lower share than the state of Louisiana, which was 16.7 percent in 2015, down from 19.2 percent. Louisiana had a significantly higher percent of young adults ages 18-24 who had not completed a high school diploma than the U.S. percent in both 2014 and 2015. Educational attainment data is based on U.S. Census Bureau, American Community Survey (ACS) data. Data on educational attainment was derived from answers to Question 11 on the ACS, which was asked of all respondents. Respondents are classified according to the highest degree or the highest level of school completed. The question included instructions for persons currently enrolled in school to report the level of the previous grade attended or the highest degree received. The capacity to pay for college is a factor in a student’s likelihood to persist in college. The U.S. Department of Education (USDOE) reports that, over the past three decades, tuition at public four-year colleges has more than doubled, even after adjusting for inflation. In addition, the USDOE reports that the maximum Pell Grant “covers only about 30 percent of the cost of a four-year public college education—the lowest proportion in history and less than half of what it covered in 1980.” Lastly the Louisiana State Legislature voted in June of 2016 to only partially fund the state’s merit scholarship, Taylor Opportunity Program for Students (TOPS), at 70 percent. Tuition at public four-year universities in Louisiana increased 66 percent between fiscal year 2008 and 2014, while per pupil spending decreased 41 percent over the same time frame. Not surprisingly then, the share of college cost that students and families pay at Louisiana’s public universities has increased by 85 percent over the same period. 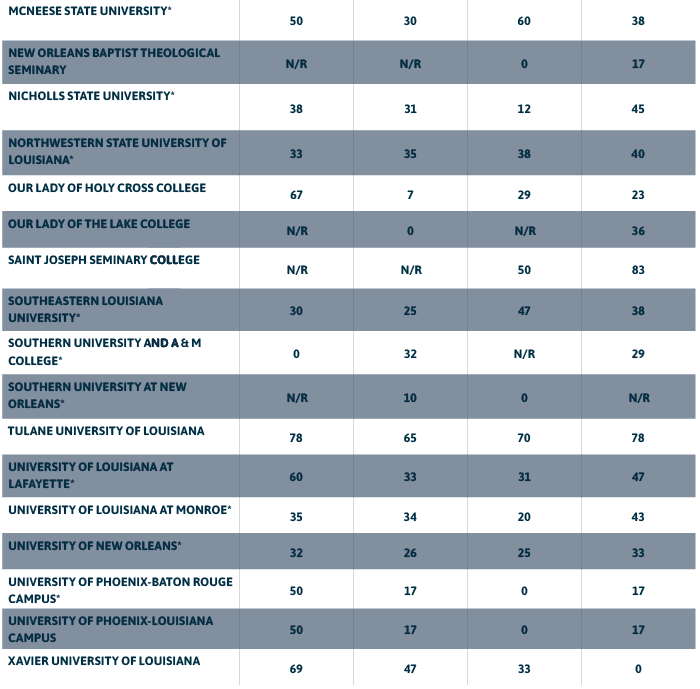 Based on these and other similar criteria, The Young Invincibles, a college affordability advocacy group, gave Louisiana a “D-“ on its Student Impact Report Card, which measures budget support for public higher education. Focusing specifically on the affordability of the state’s flagship university, Louisiana State University and Agricultural and Technical College – Baton Rouge, the average net price is disproportionately higher for students from low-income families. For a family that earned $30,000, the net price was approximately 17 percent of that income level; whereas, for a family that earned $110,000, the net price was 15 percent of their income. Beginning students are those who are entering postsecondary education for the first time. Title IV aid to students includes grant aid, work study aid, and loan aid. These include: Federal Pell Grant, Federal Supplemental Educational Opportunity Grant (FSEOG), Academic Competitiveness Grant (ACG), National Science and Mathematics Access to Retain Talent Grant (National SMART Grant), Teacher Education Assistance for College and Higher Education (TEACH) Grant, Federal Work-Study, Federal Perkins Loan, Subsidized Direct or FFEL Stafford Loan, and Unsubsidized Direct or FFEL Stafford Loan. For those Title IV recipients, net price is reported by income category and includes students who received federal aid even if none of that aid was provided in the form of grants. While Title IV status defines the cohort of student for which the data are reported, the definition of net price remains the same – total cost of attendance minus grant aid. College enrollment is the first major step towards completing a college degree. Most college students enroll in college immediately after finishing high school. Therefore, the percentage enrolling in college immediately after high school reflects the majority of high school graduates who will ever enroll in college, and the value graduates place on attending college compared to working, entering the military, starting families, or pursuing other interests. The benefits of earning a college degree include a variety of economic well-being and career attainment benefits. Today’s college graduates earn more annually, have lower unemployment and poverty rates, and have more satisfaction with their jobs than those with only a high school diploma. The percent of New Orleans students who enrolled in a 2-year college the first Fall after graduating from high school in the 2012-2013 school year was 20.4 percent, while the percent who enrolled in a 4-year college was 34.7. For the state of Louisiana overall, 18.6 percent of 2013 graduates enrolled in a 2-year college, and 39.4 percent enrolled in a 4-year college. The percent of New Orleans students who enrolled in a 2-year college the first Fall after graduating from high school in the 2013-2014 school year was 22 percent, while 36.8 percent enrolled in a 4-year college. For the state of Louisiana overall, 20.1 percent of 2014 graduates enrolled in a 2-year college and 38.9 percent enrolled in a 4-year college. How are the children doing? Read these insights from New Orleans residents. This indicator provides one measure along a pathway to college completion. To get a fuller picture, data on the number of students who enroll and subsequently graduate is needed. Years in graphic represent the year of graduation from high school. In an increasingly global and competitive environment, individuals without college degrees are much more limited in their employment and earnings potential. A high school diploma is worth less than in the past. The Pew Research Center found that the value of a college degree is increasing with time while high school diplomas are depreciating. Today, 22 percent of young adults age 25 to 32 in the U.S. who have only a high school diploma are living in poverty, compared to 7 percent of Baby Boomers who had only a high school diploma in 1979 when they were in their late 20s and early 30s. Graduation rates are important because they reveal how well an institution holds on to and graduates its students. Data reveal serious disparities in the higher education setting. 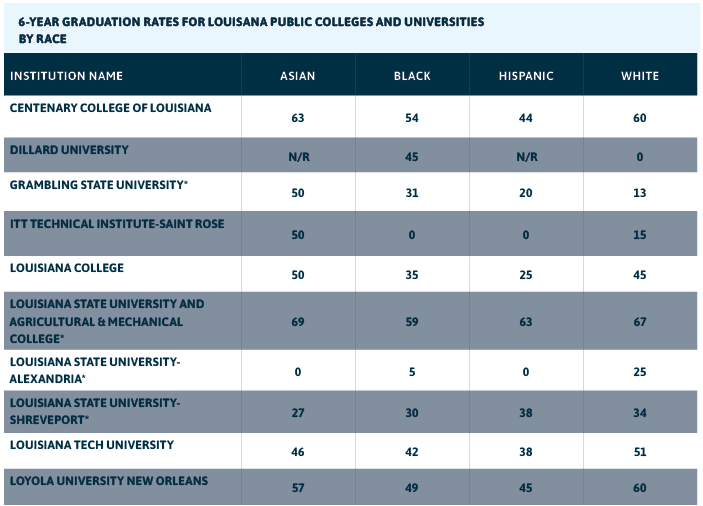 To describe “holding power” of Louisiana public colleges and universities and differences by race, six-year graduation rates were examined. Graduation rates reveal that more than 41 percent of whites who enrolled in Louisiana colleges and universities in 2007 graduate within six years compared to 34 percent of blacks. Some institutions are not shown because of missing data. This analysis was originally conducted by Rashida Govan, Andre Perry and Debra Vaughn as part of the Urban League of Greater New Orleans’ “State of Black New Orleans 10 Years Post-Katrina”. Rates were generated using the institutional comparison tool in the Integrated Postsecondary Education Data System (IPEDS) from National Center for Education Statistics using U.S. Department of Education 2013 data. The value of earning a college degree includes a variety of economic and professional benefits. Today’s college graduates earn more annually, have lower unemployment and poverty rates, and have more satisfaction with their jobs than those with only a high school diploma. Further, when compared to people who earn an associate’s degree, or some college, people who have a bachelor’s degree earn more and are less likely to be unemployed. In both 2014 and 2015, the share of young people age 18-24 who had completed a bachelor’s degree in New Orleans was significantly higher than that of the state. The New Orleans share was 12.8 percent in 2015 compared to the state, which was only 7.4 percent. Educational attainment data is based on U.S. Census Bureau, American Community Survey (ACS) data. Data on educational attainment was derived from answers to Question 11 on the ACS, which was asked of all respondents. Respondents are classified according to the highest degree or the highest level of school completed. The question included instructions for persons currently enrolled in school to report the level of the previous grade attended or the highest degree received. The state Board of Regents does provide a report on the degrees and certificates awarded by the home parish of the recipient. However, it does not provide the age of the completer. It also only includes data on the state’s 34 public colleges, universities and professional schools. Studies have shown there are a variety of long-term consequences of child abuse and neglect. These long-term effects include chronic health conditions, disrupted brain development, cognitive delay, language difficulties, behavioral problems, juvenile delinquency, alcohol and other drug abuse, low self-esteem, depression, relationship difficulties, anxiety, and other psychiatric disorders. In 2010, 13 allegations of abuse and neglect per 1,000 children were reported in New Orleans compared to 23 per 1,000 children in Louisiana. New Orleans fares better than the state overall on this indicator. The number and rates of allegations do not reflect the number or rates of abuse and neglect. Some allegations were confirmed as valid and others were not. However, an investigation that leads to an invalid or other finding only indicates that there was insufficient evidence to make a valid confirmation. In addition, experts argue that child abuse and neglect is underreported, and standards for reasonable suspicion of abuse and neglect are not always clear-cut. As a result, official reports do not capture all cases in which child abuse and neglect is suspected or even is detected or acted upon. A non-Child Protective Services (CPS) study suggested that an estimated 1 in 4 U.S. children experience some form of child maltreatment in their lifetimes. Child death rates in a community, regardless of cause, can be an important indicator of general health and well-being of the community. A high death rate can point to underlying causes such as such as poor access to prenatal care, violent neighborhoods, or inadequate child supervision. Child murder specifically indicates the number of children who have died as a result of violence or abuse directly from another person. Therefore, it is an important measure of child safety. In 2014, there were a total of 150 murders in New Orleans; 12 of those murders were of children under the age of 18, and 43 were of young adults from 18 to 24 years of age. The 18-24 year old age group represented a disproportionate share of the homicide victims compared to its share of the population. In 2014, the 18-24 year olds represented 10 percent of the population, but represented 29 percent of homicide victims. In 2015, there were a total of 164 murders. Of these, 11 were murders of children younger than 18; 40 were murders of young people ages 18 to 24. Youth age 18-24 continue to represent a disproportionate share of homicide victims. In 2015, 18-24 year olds represented only 10 percent of the population, but represented 24 percent of homicide victims. Homicide data was obtained from two Times-Picayune news articles. The New Orleans Police Department reports data online at http://www.nola.gov/nopd/crime-data/crime-stats/. However, age data is not included. The practice of placing children in adult jails has grown in recent years, but it has yielded negative impacts on both the children awaiting trial and on the community at large. The children who await trial in adult facilities lack access to developmentally appropriate resources. Worse yet, these children are at risk of assault and abuse. And studies have concluded that placing children in adult facilities has had no deterrent effect on their future criminal behavior. Finally, prosecuting youth in the adult system has led to 34 percent greater recidivism among those youth. On average, 16 children age 17 and younger were detained in New Orleans’ local jail (misnamed the “Orleans Parish Prison” or “OPP”) each day in the third quarter of 2016. During this period, the number of children detained at OPP each day ranged from a low of 10, to a high of 25. This average was calculated by dividing the total number of days each youth spent in OPP by the number of days between July 1 and September 30, 2016. “How are the children doing?” is a question we can ask youth directly. Without input from children and youth, those who serve them miss opportunities to improve participation, quality, and delivery of programs. Without the youth’s voices, it’s hard to even consider them as truly active participants in youth programs. According to the Center for the Study of Social Policy, “Getting youth to participate in activities and decisions that adults ultimately control is not true engagement. Authentic youth engagement requires that young people have actual authority and responsibility, as well as opportunities, to develop the skills needed to make sound decisions.” Consequently, schools, programs, and initiatives need youth voice to authentically engage with them. In addition, positive school climate boosts student achievement according to “Research Synthesis of the Associations Between Socioeconomic Background, Inequality, School Climate, and Academic Achievement,” a new study in Review of Educational Research, a peer-reviewed journal of the American Educational Research Association. To gauge climate, one has to listen to and assess student voice. Read insights from New Orleans youth. HOW ARE NEW ORLEANS’ YOUTH DOING? The Data Center is committed to finding ways to capture student voice. In the summers of 2016 and 2017, The Data Center partnered with the New Orleans Center for Creative Arts (NOCCA) Media Arts Department to produce student films, which responded to the question, “How are New Orleans’ children doing?” NOCCA students and alumni addressed data indicators in The Youth Index. The students were guided by their instructor and producer Isaac Webb, NOCCA’s Department Chair of Media Arts. View videos created by NOCCA students to see what youth had to say about data in The Youth Index.